On The Buses – for 50 Years! 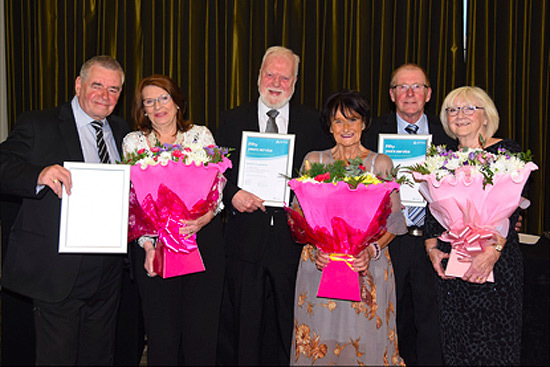 Photo above: Ken Cherry, and his partner Barbara, being presented with his 50 years of service award at the Arriva Long Service Awards alongside colleagues (R-L) Dennis Holding, and his partner Brenda, and Stuart Poole and his wife Catherine (far right). Ken Cherry, of Seaforth, has been honoured at a special ceremony for reaching 50 years of service with Arriva North West. Mr Cherry, 69, was presented with his accolade at the Long Service Awards ceremony at Aintree Racecourse on Merseyside, alongside Arriva colleagues who were up for their 25, 30, 35, 40, 45 and 50 years of service awards. Now a bus driver with Arriva, Ken started his career with the company in 1967 as a bus conductor – the year that Martin Luther King was assassinated, Enoch Powell delivered his ‘Rivers of Blood’ speech, the Beatles launched the ‘White Album’, and British Post introduced First Class Post –when a bus ticket cost as little as three pence ‘old money’ a journey. After three years at the company, Ken trained as a bus driver working at the Litherland depot, before moving to Walton in 1986, and then St Helens in 1989 where he currently resides. During his 50 years with Arriva, Ken and his wife Barbara – who were already together when Ken joined the company – have married, bought their first home and welcomed the addition of two sons Paul (42), and Christopher (38) to their family. This year, they’re also celebrating their 48th wedding anniversary.